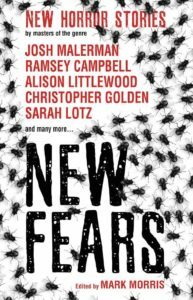 New Fears has stories from Alison Littlewood, Stephen Gallagher, Brady Golden, Nina Allan, Brian Keene, Chaz Brenchley, AK Benedict, Brian Lillie, Ramsey Campbell, Carole Johnstone, Sarah Lotz, Adam Nevill, Muriel Gray, Josh Malerman, Conrad Williams, Kathryn Ptacek, Christopher Golden, Stephen Laws and little old me. The book will be out on September 19, and there will be a signing at the British Fantasy Convention over the weekend beginning September 29. This entry was posted in News and tagged Adam Nevill, AK Benedict, alison littlewood, Brady Golden, Brian Keene, Brian Lillie, British Fantasy Convention, Carole Johnstone, Chaz Brenchley, Christopher Golden, Conrad Williams, Josh Malerman, Kathryn Ptacek, Mark Morris, Muriel Gray, New Fears, nina allan, Ramsey Campbell, Sarah Lotz, Stephen Gallagher, Stephen Laws, Titan Books. Bookmark the permalink.